Nikki Haley, the U.S.’s ambassador to the United Nations, is leaving the Trump administration. Unlike so many Trump officials before her, however, Haley is apparently leaving on good terms. Haley has been “very special to me,” Trump said in a press conference at the Oval Office, saying she has done “a fantastic job.” Haley is reportedly taking a “little time off,” he said, but said she’s welcome to come back to the White House if she wants. She will leave her post at the end of the year. “It has been an honor of a lifetime,” Haley said. “The US is strong again.” She touted her very bad decision to move Israel’s embassy to Jerusalem as a key accomplishment. “I don’t have anything set” for future plans, Haley said. “No, I am not running in 2020.” Instead, she will help Trump campaign for re-election. 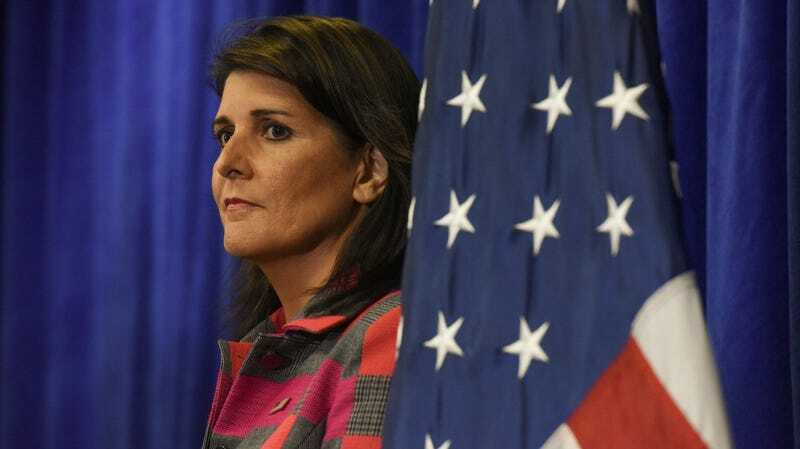 The Trump administration will announce Haley’s successor in the coming weeks. It has not been announced whether her $52,000 curtains will be leaving with her. Do You Think Nikki Haley&apos;s $52,000 Curtains Are Nice?